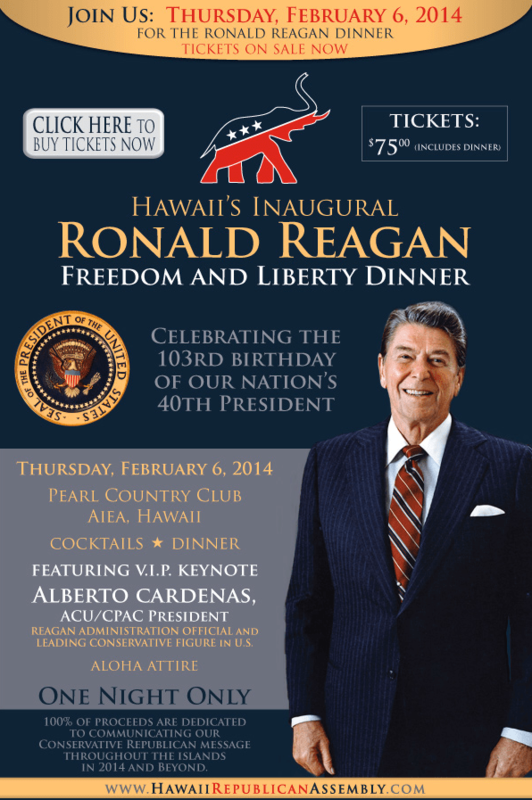 BY TITO MONTES – Please join your fellow Republicans and conservatives at the inaugural Ronald Reagan Freedom and Liberty Dinner NEXT WEEK, on Thursday, February 6, 2014 at the Pearl Country Club. Affordably priced at just $75.00 (including dinner and parking), tickets to the Reagan Dinner are on sale now. Without question, this is the big evening for Hawaii’s conservative movement. Next week, February 6th, ticket holders will gather with special guests for cocktails and dinner, then hear from the leader of our nation’s leading and most prestigious conservative organization: Alberto Cardenas. A man born in Havana, who escaped with his family from communist Cuba and then went on to co-chair Reagan’s Florida campaigns for president and later worked for both the Reagan and Bush administrations. Starting in 1993, Cardenas’ decade of service as leader of the Florida GOP saw the sunshine state’s minority party gain majorities in the state legislature and congressional delegation for the first time since reconstruction. Mr. Cardenas now works each day to unite the efforts of top conservatives and Republicans across the country as president of the pace-setting American Conservative Union (ACU) and the Conservative Political Action Conference (CPAC). 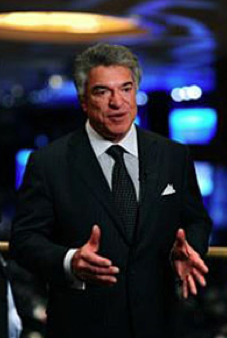 Al Cardenas is the one political leader who can bring conservatives together like no one else. And by headlining HIRA’s inaugural Reagan Freedom and Liberty Dinner, this also marks the first time ACU/CPAC’s leader has officially visited the islands. Our keynote speaker Alberto Cardenas will coming from Washington, D.C. for next week’s gala dinner on February 6th . And we sincerely hope that you will be able to make time to join us for a very special night. Tickets can be purchased online HERE. Or you can mail a check payable to HIRA to our address: Hawaii Republican Assembly, P.O. Box 2567, Ewa Beach, HI 96706. Tickets are just $75 each (includes dinner and parking). Personal, corporate and PAC contributions are most welcome. Sponsorships and tables are also available. We hope to see you on this special evening which celebrates the late, great Ronald Reagan and unites conservatives at this crucial time in Hawaii’s history. Mahalo for your kokua.